Yeha a very evocative and peaceful spot is the most enigmatic attraction. 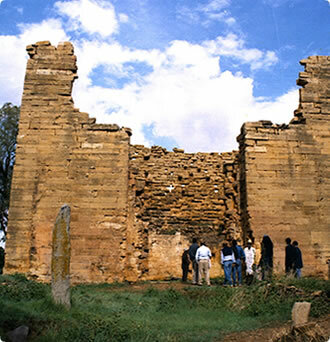 Yeha was the first well known capital city of Ethiopia and is the birthplace of Ethiopian civilization. Ethiopia’s earliest known capital, Yeha, is less than two hours’ drive from Axum through some dramatic highland scenery. As the birthplace of the country’s earliest high civilization, it is well worth visiting. To get there, head east for twenty kilometers (Bahar Dar is a town 12 miles ) to Adwa. Continue along the main road towards Adigrat for another twenty-four kilometers (15 miles) and then turn north on to a short dirt track, where you will see the imposing ruins of Yeha’s Temple of the moon about four kilometers (2.5 miles) to the right of the track.